According to a new national survey, approximately 4.3 million Canadians (12.3 per cent) have gone gluten-free, or have reduced gluten in their diets. The Canadian Attitudes to Gluten-Free Study, commissioned by Udi’s Healthy Foods, surveyed 2,530 randomly selected Canadian adults. The survey also revealed that British Columbians are most likely to have made the switch (17 per cent), followed by those in Ontario, Quebec and Alberta (12 per cent in each province). Gluten is a protein found in wheat, rye and barley. Gluten in flour helps to provide bread and other baked goods with strength, structure and good texture. Gluten is also found in smaller amounts in foods such as commercial soups, salad dressings, sauces and other foods made with hydrolyzed wheat protein or other gluten-containing ingredients. If you have celiac disease or non-celiac gluten sensitivity, it is very important to follow a gluten-free diet for your health. Removing gluten from your diet might sound simple, but gluten is found in many foods in trace amounts and can also be cross-contaminated in manufacturing plants. Look for labels that promote gluten-free and if you are unsure you can contact the producer directly that is typically listed on the package to find out more. What are some of the challenges of following a gluten-free diet? Remember some of the basic foods you likely already have in your household are healthy gluten-free options that supply carbohydrates needed for your brain and muscles, such as potatoes, yams, corn, rice and rice noodles. Legumes such as lentils, chickpeas and black beans are also healthy carbohydrates loaded with nutrition. Some foods that require minimal preparation that are easy to add into your meals include gluten-free bread, rice/quinoa crackers, corn tortillas and corn tortilla chips. There are many gluten-free ready-to-serve breakfast cereals, as well as hot cereals that make breakfast and snacks easy. Note that oats are cross-contaminated unless advertised gluten-free. Try the growing selection of gluten-free pasta options available such as rice, quinoa, oat or corn based pastas. For the adventuresome eater, try some of the other highly nutritious gluten-free grains such as quinoa, millet, amaranth or buckwheat. For baking items such as muffins and pancakes, try out a gluten-free flour recipe using an assortment of flours or buy a pre-mixed version. Work with a registered dietitian and the resources from the Canadian Celiac Association to understand the hidden and cross-contaminated ways you may find gluten in your diet. Some of the common surprises for our clients that contain gluten include items such as soy sauce, teriyaki sauce, commercial soups/soup bases, licorice, some chocolate, some deli meats/sausages and beer. Look for properly labelled gluten-free options of these foods. Some of the most common cross-contaminated foods include commercial oats (unless labelled gluten-free), as well as restaurant meals (especially those placed in a deep fryer). Use a separate toaster and condiment containers for items such as peanut butter, butter/margarine and jam than other family members. The Canadian Celiac Association, gluten-free cookbooks and an online gluten-free community is a great place to collaborate about the best recipes and reliable products. Many of our clients have found in the past the quality and texture of many gluten-free baked goods are poor, but the good news is that there are now so many more delicious products available that you can find at your regular grocery store. Homemade sweet potato oven fries, baked chicken with gluten-free herbs and steamed veggies. Taco salad with tossed green salad, ground meat/poultry with gluten-free seasonings, green peppers, corn, gluten-free salsa, sour cream and gluten-free taco chips. Gluten-free bread made into French toast with fresh fruit and cottage cheese or yogurt. Stir-fry with mixed veggies, shrimp/beef and gluten-free soy/teriyaki sauce and rice or rice noodles. Rice or quinoa based salad with toasted seeds/nuts, black beans/chick peas and raw or leftover roasted veggies with a vinaigrette. Spread 1 tablespoon of pizza sauce on one side of a bread slice. Top with half the cheese, pineapple, and ham and place another bread slice on top. Lightly coat a non-stick frying pan with olive oil, margarine, or butter and warm over medium heat. Add the sandwich and cook for 3 to 4 minutes per side or until golden brown, flipping once. Transfer to a plate and make the second sandwich with the remaining ingredients. Slice each sandwich into four “fingers” and serve with the remaining pizza sauce on the side for dipping. 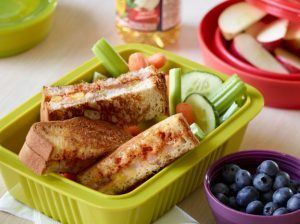 Allow sandwiches to cool completely before packing for lunch to prevent sogginess. Makes 2 servings.